Looking for Easter break destination ideas ? What better than spring to discover or rediscover the beauty of Switzerland. I braved the cold weather of February to write about places that you might have never thought to experience. Let’s get back to basics and explore local ! What I like the most about Zurich is its contrast between classical architecture and the modern/design twist omnipresent in the popular and newest spots. One of my favorite hotel to spend a weekend in the city offers the right comprise. Nestled on top of a hill in kreis 2, B2 Boutique Hotel is an old brewery (former Hürlimann brewery, one of the oldest of Switzerland), recently converted to a modern hotel. Such a blend of urban design, style and elegance yet mixed with history is something rare and very unique to see in Switzerland. Old beer production lines have been converted to create probably one of the highest rated boutique hotels in Zurich. SLEEP – in one of the 80 rooms, each one named and designed with love and care. Don’t forget to enjoy the complimentary Hürlimann beers of the mini bar. EAT – at the lobby restaurant, surrounded by more than 30,000 books and enjoy this unique atmosphere ! ENJOY – the thermal baths in gigantic wooden basins and the fabulous view over the city from the rooftop pool. CAFE HENRICI: Indulge yourself with a delicious coffee in the heart of the old town. The place is cosy and ideal for an afternoon get together or a late breakfast/brunch. CAFE FRANZOS: A tiny cafe that you can’t miss ! This french inspired place is the perfect spot to enjoy a tasty crêpe or a tarte tatin. No excuse for a stylish quick lunch option. Continue your journey through Switzerland by taking the train on the way to the very touristic Interlaken. Touristic but rarely explored by locals. What a pity, Thoune’s lake is probably one of the most amazing wonder of central Switzerland. Take a break and enjoy the emerald green color of its water as well as its unique « Belle Epoque » atmosphere. Sitting close to the edge of the lake is the Victoria Jungfrau Hotel. If there ever was a place to put the next movie version of « Shining” or “And Then There Were None” then this is the one. Decorated in « Belle Epoque » style, this 150 years old hotel is more than just a beautiful building, it offers a wide selection of recreational facilities such as pools, spa, sauna, billard and even tennis courts. SLEEP – in one of the deluxe junior suite VJ club rooms overlooking the Alps. Recently renovated, these rooms are spacious & cosy, and the elegant white and grey interior is a bliss for design lovers. EAT – in one of the two hotel’s restaurants: the prestigious « La Terrasse » restaurant (15 Gault Millau points) or the newly opened Italian restaurant « Sapori ». ENJOY – the 5,500-square-meter spa ranked as one of the most beautiful of Switzerland. For having tested it, it truly deserves its recognition. The region of Interlaken offers a wide range of activities such as cruises on either Thoune’s or Brienz’s lake, visiting the mysterious St Beatus caves or enjoying the view over the three world-famous summits Eiger, Mönch & Jungrau, from the easily accessible Harder Kulm. Last stop of your swiss trip: the capital city and its sister, Fribourg, located only 20 minutes away by train. Both cities are true architectural gems and easily explorable in one day. Spend time to admire the fascinating medieval arcades of Bern’s old town, as well as the unique gothic atmosphere of these two mystical cities. Book a room at Schweizerhof hotel in Bern. This historical place where numerous of celebrities stayed at is ideally located right next to the train station. Known for its first-classe service, this prestigious hotel is the perfect spot for a practical and relaxing stay. SLEEP – in one of the 99 stylish rooms. The warm design and furniture make you feel at home. EAT – at Jack’s brasserie, the legendary restaurant of the hotel. 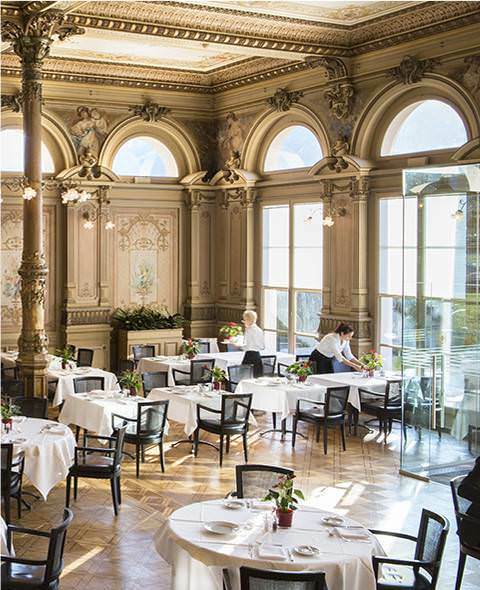 Breakfast time is your chance to fully enjoy the vintage ambience of this old-time brasserie. ENJOY – the spa facilities or the wonderful view over the city’s roofs from the sky terrace. LES TRENTENAIRES: I tried the brunch and I loved it ! Excellent value for money and a great choice of local beers ! One of the best place in Fribourg. CAFE DU BELVEDERE: Located in one of the oldest building of Fribourg’s old town, this secret spot offers a breathtaking view over the city, as well as a great selection of local beers and other handmade sweet indulgences.